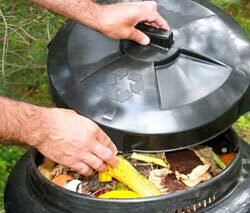 Composting must rate as the most complete way to help enrich your soil. Compost can help provide your garden areas with an inexpensive, high-quality material which can amend and improve not only the quality of your garden soil, but also the texture and ability to retain moisture. The act of mixing a blend of several types and consistencies of organic material together produces a "composite", the term from which compost was derived. When you build a compost pile, it should be made up of 3-4 parts "brown" or carbon containing material to 1 part "green" or nitrogen containing material in order to produce the decaying environment needed for a nutrient rich mixture. Avoid using too much moist greenery or you'll end up with strong-smelling slime rather than healthy decomposed matter. Avoid using pinecones and thick, woody items when building or adding to your pile. Thicker wood pieces take a long time to decompose and will cause lumps in your finished material. If you wish to use wood products, process them through a chipper or shredder so the pieces are smaller and require less time to decay and decompose. Remember: your pile should never smell bad. If the pile begins to take on a bad odor, you'll need to add more carbon containing materials like leaves, straw, or black and white newspaper sections to re-establish the proper balance of ingredients. By starting with a pile that is 3ft high, 3ft wide, and 3ft deep, you'll provide a means for efficient decomposition while keeping the pile easily workable. The larger your pile of material, the more difficult it becomes to manage. You can start your pile on the ground, or enclose an area in chicken wire or inside a wooden frame, or use a plastic compost barrel. You might even check out some of the store bought composting bins available to hold your mixture. 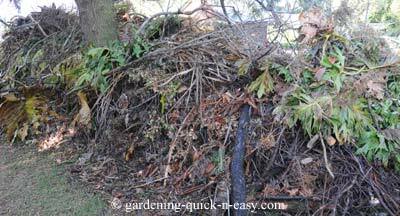 You can work with a single compost pile set up or work with groups of two or three piles at different stages of decay. 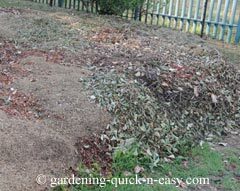 If you choose to build your pile on the ground, use twigs for the bottom layer to allow air to circulate around the bottom of the pile also. Rather than dumping clumps onto your pile, add your material in thin layers trying to maintain a proper balance of "brown" (carbon containing) to "green" (nitrogen containing) ingredients. This allows the pile to receive plenty of oxygen to help it continue to "cook" or mature. You can expect to be able to have and use your homemade compost in 6-10 weeks. If you're looking for an easier way to mix your ingredients rather than hand turning your pile, there are compost tumblers, barrels and bins available on the market. Some of the obvious advantages over open air piles are that these containers provide a cleaner, neater, pest-resistant and odor-free way of decomposing materials. Typically, they will also retain moisture better than the open air piles. Note: We'd love you to add any helpful tips about making compost, and we'd love to feature your compost pics too.